An off-duty Toronto Police officer restrained a woman in a mental-health crisis who was trying to go onto train tracks in Durham. Sergeant Amarjit Singh, of Traffic Services Support Operations, was waiting for the 5:21 a.m. train at the Ajax GO station on May 18 when he noticed a dark figure moving near the tracks in the early-morning light. “The person started to walk towards the tracks and that’s when I said, ‘Hey, what are you doing there?’” he recalled. Singh managed to reach down and pull the woman up on the platform. When Singh identified himself and displayed his badge, the woman begged him not to arrest her. Singh was forced to pin the woman to the ground. “During that time, people were telling me to get off of her. I guess they didn’t know what was happening and who I was,” said Singh, who identified himself as a police officer, when approached, so no one misread the situation. Durham Regional Police Service officers arrived a few minutes later, apprehended the woman under the Mental Health Act, and took her to hospital. 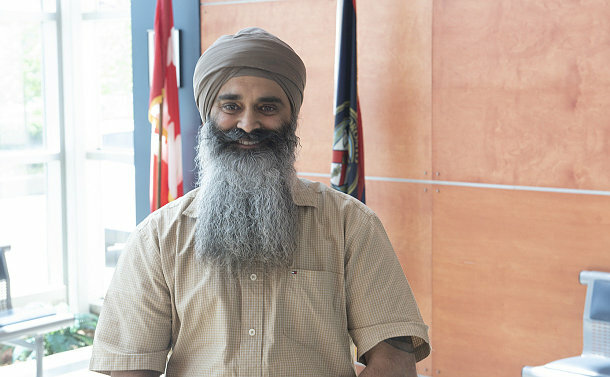 GO Transit contacted Singh to thank him for intervening and ensuring the woman’s safety. This is the second time in his 28-year police career that Singh was called into action while off duty. He arrested a street robbery suspect in Scarborough nearly 20 years ago.